Jetha Patel, head of Sabar Dairy was on Friday unanimously appointed as the new chairman of Asia's largest milk federation, Gujarat Cooperative Milk Marketing Federation (GCMMF) which markets its products under the brand name Amul. 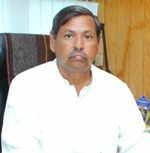 Patel was elected to the post after the unceremonious ouster of former Chairman Vipul Chaudhary. "Banas Dairy's Chairman and former Chairman of GCMMF Parthi Bhatol today proposed the name of Jetha Patel at GCMMF board meeting, which was supported by Anand Dairy's Chairman Ramji Patel and later all the 17 members of the Federation," said a statement from the GCMMF. Board members of GCMMF later declared before media that Jetha Patel of Sabar Dairy has been unanimously elected as the new chairman. Chaudhary, who was ousted in January this year, also supported Jetha Patel's name. Chaudhary had earlier approached the High Court and Supreme Court against the no confidence motion moved against him. After getting a nod from apex court, GCMMF on Friday held the election in the presence of poll observer. Later talking to media, the newly-elected chairman said that GCMMF will aim at providing sale of milk and its products at reasonable prices. "It will be our aim to provide milk and the products related to it at reasonable rate. We will also focus for the development of the farmers," Jetha Patel told reporters. Patel further said that all the members of GCMMF, including Vipul Chaudhary, are with him and will support the cause for the development of farmers and milk-producers. BJP's spokesperson and senior state leader I K Jadeja was also present during the election. Later, he congratulated Patel on being elected as the chairman of GCMMF and said that state and centre is committed towards the development of farmers and milk-producers. "Chief Minister Anandi Patel and Prime Minister Naredra Modi both aim for the development of milk unions of Gujarat. Both the state and centre are committed for the progress of milk sector," Jadeja said. GCMMF is having an annual turnover (2013-14) of US dollar 3.0 billion. Its daily milk procurement is approximately 13.18 million litre per day from 17,025 village milk cooperative societies, 17 member unions covering 31 districts, and 3.23 million milk producer members.